Walters had often dreamed of flying but was unable to become a pilot in the United States Air Force because of his poor eyesight. He first thought of using weather balloons to fly at age 13 and 14, after seeing them hanging from the ceiling of a military surplus store. Twenty years later, he decided to try it. His intention was to float over the Mojave Desert and then use a pellet gun to burst balloons to gracefully float to the ground. In mid-1982, Walters and his girlfriend, Carol Van Deusen, purchased 45 eight-foot (2.4 m) weather balloons and obtained helium tanks from California Toy Time Balloons. Walters attached the balloons to his lawn chair, filled them with helium, put on a parachute, and strapped himself into the chair in the backyard of a home in San Pedro. He took his pellet gun, a CB radio, sandwiches, beer, and a camera. 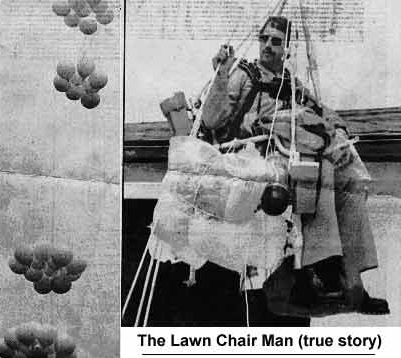 When his friends cut the cord that tied his lawn chair to his Jeep, Walters’s lawn chair rose rapidly to a height of about 16,000 feet (4,900 m) and was spotted from two commercial airliners.At first, he did not dare shoot any balloons, fearing that he might unbalance the load and cause himself to fall out. He slowly drifted over Long Beach and crossed the primary approach corridor of Long Beach Airport. After causing a considerable stir with pilots whose flight paths were crossed and Air Traffic Control, he miraculously landed in a residential neighborhood, with his ropes entangled on a power line and blacking out a neighborhood for 20 minutes. Walters had gained considerable notoriety and was cited for violating air traffic rules and eventually paid a $1,500 fine, according to news reports. Sadly, Walters life did not take on a positive trajectory and he died by suicide in 1993. 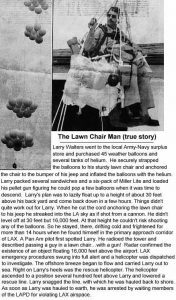 “The Lawn Chair Pilot” calls itself the ‘Official Website’ and details Larry Walters’ life. So … what is the Inspiration??? our lives are a quest to make it happen. 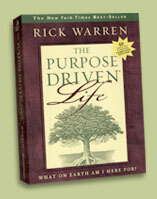 It is one of the significant 100 Christian Books That Changed the 20th Century.